Heat has a powerful effect on the operation and lifespan of electronic devices. Introducing components like heat sinks within these electronic systems helps maintain cooler temperatures and promotes healthy performance. As we demonstrate with our disk-stack heat sink example, simulation is a powerful tool for analyzing the efficiency of heat sink designs. 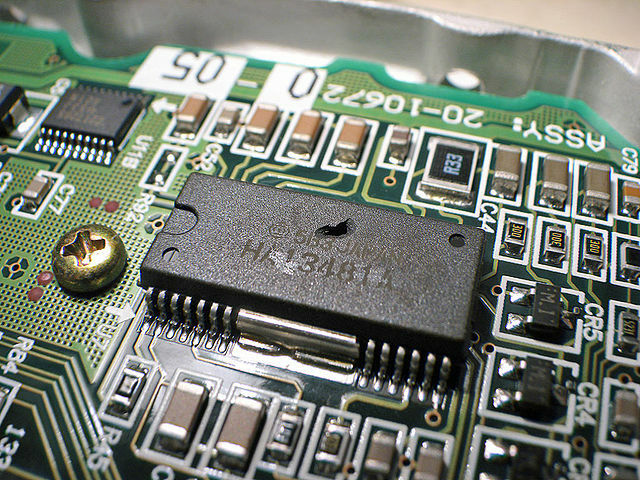 When an electronic device becomes overheated, components within the device can begin to wear out more quickly and degrade or simply enter into safe mode and stop working. These effects can ultimately cause premature failure of the system as a whole. As such, thermal management plays an influential role in the functionality and performance of today’s electronic devices. As these technologies continue to advance, it becomes more important to find ways to efficiently dissipate heat within the electronic systems. An integrated circuit that has overheated. “No blue smoke” by Danamania — Own work. Licensed under CC BY-SA 2.5 via Wikimedia Commons. One approach to cooling electronics is to incorporate heat sinks in the system’s design. Used in both computers and power transistors, to name a few applications, these passive heat exchangers work by absorbing heat from the electronic device and dissipating it into the air. Note that heat sinks can also be combined with fans to actively cool the device’s components. The spreading of heat helps regulate the device’s temperature and prevent any of its components from overheating. For a heat sink to be efficient, it is important that it is fixed properly to minimize the thermal resistance between the heat sink and the device dissipating energy. 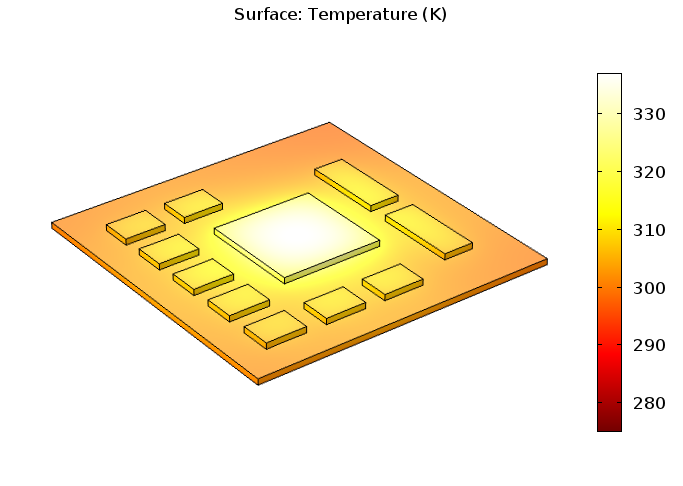 Let’s explore the role of simulation in ensuring the efficiency of a heat sink’s cooling effects. 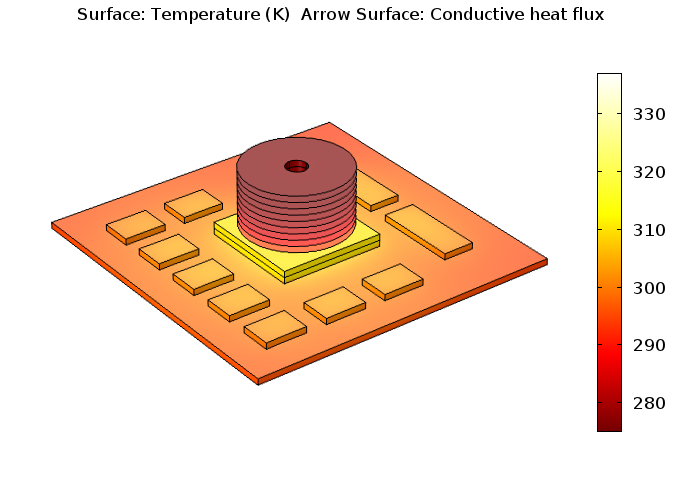 Our Disk-Stack Heat Sink tutorial is based on a scenario in which a disk-stack heat sink is added on an electronic component. The heat sink is comprised of several thin aluminum disks stacked in a column, a configuration that increases the surface dissipation of heat. In our broad-level analysis, we assume that the printed circuit board (PCB) is homogeneous and has anisotropic thermal material properties. The thermal conductivity is therefore higher along the board than through it. This is often the case, as PCBs are typically comprised of many layers of flame-resistant material with copper traces along the board. The large central chip on the board dissipates 20 W, the assortment of smaller chips dissipate 1 W each, and the two chips that are elongated each dissipate 2 W. To model the thermal contact between the central chip (or integrated circuit) and the heat sink, we use the theory highlighted in Heat Transfer Handbook by A.D. Kraus and A. Bejan. The corresponding implementation relies on the Thermal Contact feature and accounts for the contact pressure (20 kPa) as well as the surface properties and thermal properties of the air filling the gap between the surfaces. To begin, we perform a simulation of the board, including the integrated circuits (ICs), but without the disk-stack heat sink. The plot below shows the temperature distribution, measured in Kelvin, on the board and the chips. The central chip rises to a temperature of 337 K, which is greater than the maximum operating temperature. Temperature distribution of the PCB without the disk-stack heat sink. From these results, we can conclude that the heat diffusion through the board and the heat loss from natural convection is not sufficient to cool the chip. Adding a disk-stack heat sink to the electronic component offers a way to provide additional cooling. When the heat sink is added to the board, the maximum device temperature reduces to 312 K. That’s 25 K less than the design without the heat sink. The steep thermal gradient between the heat sink and the IC is the result of contact resistance and large cooling via the heat sink fins. Temperature distribution after adding the disk-stack heat sink. Finally, for a comparison factor, we add a copper layer to the bottom of the board in addition to the copper ground plane that is already included. Our goal is to see if this addition helps even out the temperature distribution across the PCB. The copper layer is found to have no impact on the temperature distribution. This finding is in good agreement with the fact that, along the vertical z-axis, PCB material features thermal conductivity that is rather poor. Temperature distribution after adding the copper layer.